It’s been almost a year since I made my decision to move to Cape Cod. In that time, many changes have taken place. One thing hasn’t changed– the amount of pressure I put on myself to figure out what I want to be when I grow up! Time and time again, I’ve asked Spirit– as I’m sure all of you have– to give me some insight on what career path best suits me, and how to ensure that I am financially secure. And like many of you, I don’t feel like I’ve figured it out yet. I will admit, I have a lack of patience in this department, and although I know there are many possibilities, my human need for security keeps me from veering too far off the beaten path. One of the things I struggle with is finding my place in the world, which is far more important to me than you might think. If I knew that, I could pick the right job, or career path, and finally feel peaceful about my choices, right? I often observe society’s belief that to be successful is to find a goal and pursue it. It would seem that it’s the ‘doing’ part of us, that ‘masculine’ energy that is most valued. This frustrated me, because I’ve found that any attempt to merge with that energy did not yield results for me. There has always been a feeling of resistence deep in my heart. Something that knows this is not my way, or my place in the world. Spirit heard my thoughts, and in a short time, signs began to appear. One day I came into work and noticed several spider webs outside my window. Each was perfectly shaped, and positioned in a way that was in a corner, not flush against the actual glass of the window. I let myself be still, and take in this amazing creation. I knew it was a sign, but I wasn’t yet sure how to make sense of it. At home, I noticed that at the most inopportune moments, a spider would land on me! This happened one night in particular, as I lay propped up in bed in the dark, watching TV. All was quiet, and suddenly a spider lowered itself from the ceiling right in between my glasses and my face! OK! OK! I’m listening! I had read so much about animal signs, but the ones about Spider just didn’t make sense to me. Then it hit me…. the webs. Because my question was specifically about how to go about finding my place, I was missing a very important point. You see, a spider doesn’t chase its prey. A spider creates its web, and waits for its prey to come along and become entangled it. I had been arguing with Spirit that ‘this is about survival,’ and I need to act! In an instant it became clear. I heard the soft whisper of my guides. 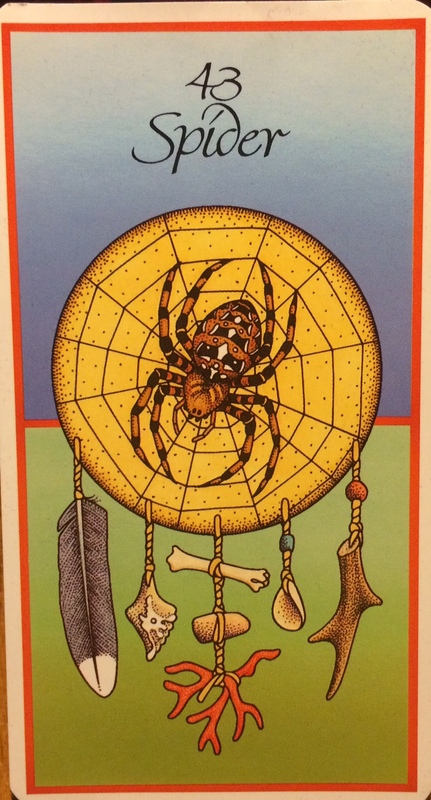 What wisdom does Spider bring to you? Listen closely and she will tell you a story about yourself. And with that, everything shifted. I stopped feeling guilty that I wasn’t aggressive enough. I ceased grinding my teeth over how it felt wrong for me to push and fight, and to take what I wanted. It’s not my way, and that’s okay. Humans make these judgements about what is right and wrong. Nature just is. We cannot all be fierce hunters, and we are not all supposed to be. My nature, my way, is different, and there was no sense in fighting it, or apologizing for it. I don’t know about you, but I’ve never seen a fly make fun of a spider because it’s just sitting there instead of chasing it. Nor have I heard of a spider that keeps itself up at night because it’s not a good hunter! So there, my friends, you have it- a simple sign that brought me great peace, understanding and brought me back to the beauty of the web of life. Always know that there is wisdom in all creation, and nothing is a mistake. The very thing you find to be a flaw in yourself, can be the very thing that saves you when you least expect it! If you would like to learn more about the card pictured in this post, you can find this deck, Medicine Cards: The discovery of power through the ways of animals, on Amazon here. ~ by healingstarspirit on September 15, 2014.